Desert Hot Springs, California, also known as DHS, is exactly what it sounds like, a desert. The desert climate leads to hot summers, warm winters, and not much rainfall to speak of. This does not mean that flood and water damage can’t happen. Broken water pipes, leaking reservoirs, malfunctioning fire emergency systems, are just a few reasons that flooding and water damage happens. 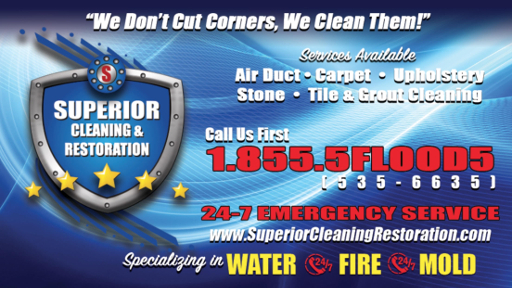 The experts at Superior Cleaning and Restoration Inc. have seen every flood disaster you could imagine. Our cleaning and restoration technicians are trained to handle the worst, all while providing a superior service. We are available 24/7, accept major insurance companies, and will work with you through every stage of the project. I need immediate help with my flood damage, can you help? Yes. Call Superior Cleaning and Restoration Inc. to get a free estimate from one of our trained cleaning and restoration specialists now. We are available for your water damage emergencies. Can you take over from a failed restoration attempt? We can restore your property no matter the state. If you were left hanging by a bad contractor, we can save the day. If the flooding and damage just occurred, we can save the day. If you are worried that your house is a flood hazard, we can save the day. Superior Cleaning and Restoration Inc. can save the day. Call us now. Are you suffering from flood and water damage in Desert Hot Springs, California? Call the professionals at Superior Cleaning and Restoration Inc. to get your problem solved by experts. Downtown DHS is gaining more traction as a hub for business. Don’t lose more business than necessary when recovering from water damage. Our superior service will get your home or business back to a superior state quicker than smaller operations. We accept many major insurance companies, are available 24/7, and will work with you for the entirety of the project. Call us today to remedy your water and flood damage problems.